This past weekend my gorgeous friend Jessica was given a baby shower. Jessica is having a healthy vegan baby and we all can’t wait to meet her! Jessica’s beautiful friend Emily, who’s not a vegan, took it upon herself to make all the amazingly delicious vegan appetizers for the baby shower. Let me tell you, they were DELISH! Thanks to all the original authors of these yummy recipes. The recipes are not mine, nor Emily’s or Jessica’s, but I believe the creators would be proud to see them and know how much they were enjoyed. Coconut Fruit Dip – Paleo & Dairy Free! 1 Cup of Coconut Cream, cold with water removed. Coconut cream is the cream on top of cold coconut milk (I use this coconut milk). I suggest refrigerating the coconut milk overnight before making this dip. The coconut water will pour out easily leaving the cream on top. Scoop cold coconut cream into a medium size mixing bowl. Whip up the cream using an electric mixer. Refrigerate dip until ready to serve. This recipe makes approximately 1 cup of dip. Serve with fresh fruit or coconut flour graham crackers. Enjoy! In a blender or in a food processor, combine all the ingredients except water, using just 3½ Tbsp of maple syrup. Puree until the mixture is smooth, about 30-60 seconds. Add water 1 Tbsp at a time to create the desired consistency. 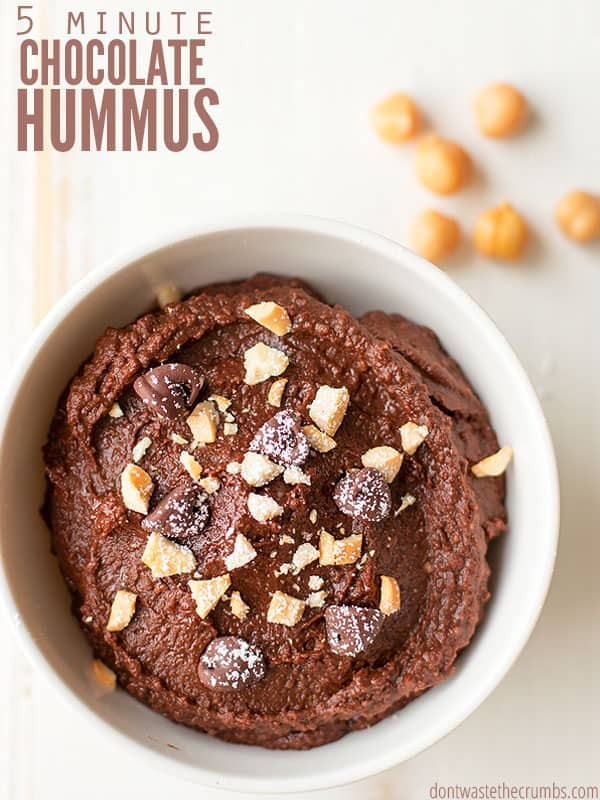 Taste the chocolate hummus and add remaining maple syrup if desired. * I’ve tested this recipe with great northern beans, garbanzo beans and black beans. I prefer to use black beans since the “bean” flavor is more subtle and they produced a creamier texture, but you can really use whatever you happen to have. * If you use canned beans and there’s salt already added, reduce the salt in this recipe to just a pinch. ** If you choose garbanzo beans, remove the skin from the bean first. You can do this by pinching the bean between your thumb and index finger, and the skin will peel off. This helps to create a creamier texture when using garbanzo beans. Put all ingredients into a blender and blend just long enough until everything is well combined – do not over process (you want to still have small pieces of artichoke).Serve with your favorite chips, crackers or veggies.Enjoy! A dairy free, whole foods version of my favorite French Onion Dip and Dill Dip combined. It’s, of course, great with potato chips, but raw veggies, pita chips or crackers would be delicious as well! Heat the vegetable broth in a large non-stick skillet over medium-high heat. Add the onions and stir to coat for a minute or two. Turn down the heat to med-low, add the onion powder, garlic powder, 1/2 tsp salt, and pepper, and stir to combine. Let the onions cook about 20 minutes, stirring occasionally. Add a 1 tbsp or 2 of water (or more veggie broth) as necessary if the onions start to stick. In the bowl of a food processor, place the cashews, vinegar, lemon juice, dill and salt. Process until it starts to come together. Scrape down the sides of the bowl, add 1/4 cup soy milk and process again until smooth, scraping down the sides of the bowl as necessary. If you feel you need additional liquid add more soy milk 1 tbsp at a time. It should be the consistency of loose cream cheese when it’s done. When the onions are done, turn off the heat and add the cashew mixture to the pan. Pour in the other 1/2 cup soy milk and stir until smooth and creamy. If you like a a dip a thinner consistency, add a little more soy milk. Let cool, then refrigerate until cold. Serve cold with chips, raw veggies or crackers. *You can slice you onions in long thin strips or dice them smaller. It’s really just personal preference. I’ve made it both way and prefer them in a dice, but both ways are good. **If you are in a hurry and don’t have time to soak your cashews, it will still work. Unsoaked cashews will make more of a cashew butter, than cashew cream, so you may need several extra tablespoons of non-dairy milk (or water would work too) to thin it out. ***I have used Silk Unsweetened Original Cashew Milk in this recipe as well. It is also very tasty…a little sweeter than using soy milk. But, any unsweetened non-dairy milk should work in this recipe. Combine “sour cream” and Italian dressing mix in a small container (or just right in the sour cream tub). Blend with stick blender or hand blender. Refrigerate several hours before serving. Homemade hummus is very easy to make and it tastes much better than anything you can buy at the store. If you don’t have any tahini, a paste made from sesame seeds, you can try making it yourself (see our Easy Homemade Tahini Recipe) or leave it out. A chickpea purée without it is still quite delicious. Just add more olive oil. Another option is to use a natural unsweetened creamy peanut butter in its place. We love serving this with flatbread — here’s our easy flatbread recipe from scratch. …Can you believe, that Emily, seen seated here, who is just about to give birth, made all those amazing appetizers for the party? Look at these two beautiful mamas to be! I was truly amazed and inspired at the amazing spread and variety! I sincerely hope you get a chance to make a few, if not at some point try them all! I promise you will not be disappointed. Your party is bound to be a success…even if most of your guests aren’t vegan.